IISER 2019: The IISER is Indian Institute of Science Education and Research. The institute has its branches in Berhampur, Bhopal, Kolkata, Mohali, Pune, Thiruvananthapuram and Tirupati. All of the institutes are renowned for their Integrated Degree programs. If you are interested to pursue any of the courses offered in the institute, find more helpful details here. 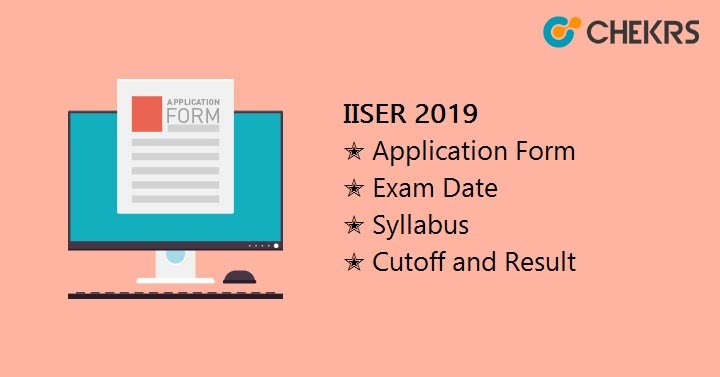 Readout information on IISER Aptitude Test, its important dates, different eligibility conditions for admission, exam pattern, result, IISER Admission Cut Off and other important details. The admission in any of the institute is done through the common process. The admission in the institute can be taken for integrated programs under Bachelors and Masters of Science/Engineering Sciences (BS-MS). The 5 year academic program enables students to pursue a career in academia, R&D institutes, and science-based industries. The KVPY qualifying students are given fellowship as per exam norms. Students of JEE Advanced Channel are given INSPIRE scholarships (criteria depends). Candidates admitted through SCB and Aptitude Test scholarships are awarded as per DST INSPIRE scheme. Interested candidates to get enroll for choicest program and branch can opt any of the three IISER Eligibility discussed below. The choicest course can be adopted by students only if they use/apply any of the listed approaches. Qualification This is the Kishore Vaigyanik Protsahan Yojana conducted yearly and appreciates the talent by awarding scholarships. If aspirants have qualified the fellowship program can seek admissions here as well. The Joint Entrance Exam is one of another medium through which willing students can avail the chance of admission. If the aspirant have managed to score within the ranks specified by the institute, (s)he can directly seek entry. The SCB stands for State or Central Boards channel. Those who have completed their 10+2 education with minimum required marks are eligible to participate in the admission process. Cut off/ Marks The eligibility of KVPY will be determined through cut off marks of the exam. Reserved (OBCNC, SC, ST, PD): Within 10,000 as per individual category rank The range of minimum aggregate marks varies from 60%-93%. As the admission in the institute can be taken through different mediums, one can easily know their important dates and IISER Entrance Exam Date through the list of events provided by us. To get enrolled in the institute, one will require filling up the application forms. Even though if someone is eligible, but haven’t applied his/her admission will not be given if IISER Admission Form is not submitted. Open the link provided by us. On the home page you will see apply now link. Register in the website and proceed to fill application form. The application submission link will appear, enter correct details in it. Once, done submit the application fee using online method. Application Fee: IISER Applicants will have to pay IISER Application Fee of Rs 2000/- (General candidates), Rs 1000/- (Reserved). As the name suggests, it will be an aptitude test, so general questions will be included it exam from the science field. Well, the test will not be really easy, thus check out the IISER Entrance Exam Pattern to make preparation easier. Marking Scheme: For each correct answer, 3 marks will be allotted while for wrong 1 mark will be deducted. The syllabus is a boon for all those who want that they don’t miss chance to get admitted. The IISER Aptitude Test Syllabus with important topics will be provided by us in detail so that learning will be precise. For all the subjects syllabus will cover details of must study sections. Te admit card is mandatory for all as it is a national level examination, it is crucial to know details your test center and other exam information. The IISER Aptitude Test Admit Card will be allotted online a few days before exam which can be downloaded easily by us. We are sharing some of awesome and for sure result oriented tips and tricks to help you get best outcome of your hard work. Follow the NCERT as basic is often asked. Download and solve the IISER Aptitude Test Previous Year Papers provided by us on a regular basis to increase knowledge of questioning pattern. Refer best IISER Aptitude Test Preparation Books. We will provide you a few in the detailed article. Don’t neglect your weaker section/subjects.